I’ll quickly revisit last month’s books before delving into what I’m reading this month. I started April off reading The Photographer’s Wife and really enjoyed it. It had a good story overall and covered some good themes such as love, marriage, adultery, dating and I guess maybe the extent we go to when we love someone. It really was a pleasant read and I think she picked a good character to focus on, out of all the ones we were introduced to. The second story I read was The State We’re In, I really liked this book up until like ¾ of the book when it became incredibly clichéd and unbearable. It was just so annoying, girl meets boy who can’t open up to anyone and then magically she’s the one who breaks his cold demeanour. That bit wasn’t too bad it was just the constant talk of how broken he was and how she was basically saving him. So much yawn. I didn’t expect the ending, but to be honest by then I didn’t really care. The final book I read was How to Be a Woman. WHAT HAVE I BEEN DOING WITH MY LIFE?! Honestly, I’ve heard so much about Caitlin Moran and kinda avoided finding out what she did/who she did. I loved How to Be a Woman, it was hilarious, insightful and I just couldn’t put it down. Seriously this a book I want to read again and again, I basically agreed with her on everything she said in the book. But what I loved about this book was that she didn’t sound like a condescending writer who just wanted you to see her view and no one else’s. If you haven’t read this book I encourage you do so, you will not be disappointed! It will ,make you laugh a lot so be prepared. I kinda love her now too. So on to this month! Pilgrim State by Jacqueline Walker - I actually picked this up in my March order along with How to be a Woman but I knew I wouldn’t be able to read it in April. I went through a stage where I basically added all books that are themed around depression and hospitalisation to my basket, and this is one of those books. 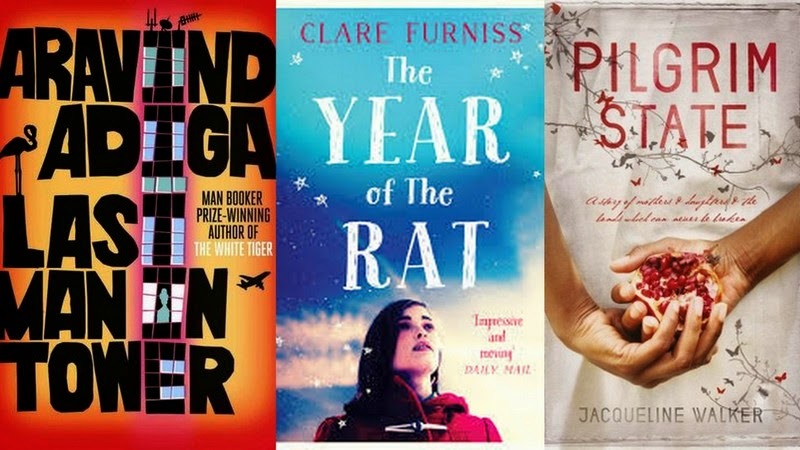 The Year of the Rat by Clare Furniss – I read about this in the Stylist, so hurrah for something I didn’t pick up in the Kindle Daily Deals or something that I’ve had in my bag for over a year, and therefore I can’t remember why I bought it. I picked this because it seemed like it would be a pleasant read and I love delving in and out of young adult books. The themes in this one are interesting to me too it has death, grief and depression and just seems to me to be a refreshing YA read. I also really like the title of this book too. Last Man in Tower by Aravind Adiga - The last book is the one I failed to read last month, so I thought I’d just add it on to this month. I think everything I said about it last month (here) still stands. I’m super excited to read it because I just enjoyed The White Tiger so much.